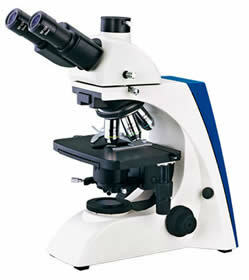 Optech Microscope Services offer a wide of microscopes to all the needs of our customers. We are able to provide you with quotations from various manufacturers including Kozo, Leica, Meiji Techno, Microtec, Nikon, Olympus and Zeiss. We have many various customers including NHS Pathology, Health Protection Agency, Asbestos Industry, Metrology, Research Laboratories, Engineering and Education establishments. Binocular phase contrast microscope complete with condenser with centring 40X phase annulus in slider, 10X and 40X BF Phase objectives, 12.5X focusing eyepieces including Walton & Beckett graticules, Green interference filter, 6v 30w halogen Koehler illumination plus centring phase telescope. 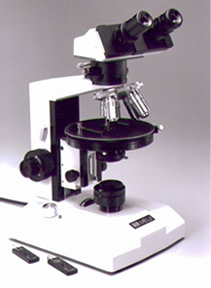 This moderately priced microscope is well used within the asbestos industry due to it being solidly built, reliable, and nicely designed. Add to this a custom build flight case and you have the perfect solution for a surveyors travelling microscope. Binocular polarising microscope complete with 10X eyepieces including Cross Line Graticule, Strain Free Plan 10X objective, Dispersion Staining 10X objective, Abbe condenser NA 1.25 with iris, Rotatable Polariser with Analyser, First Order Red compensating plate and 6v 30w Koehler illumination. 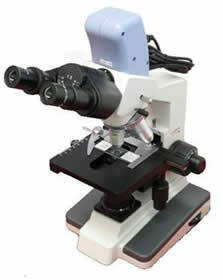 This sturdy nicely designed microscope is perfect for and widely used in the asbestos industry. The new MT9000 and MT9900 polarising microscopes are ergonomically designed using CAD technology complete with 10X focusing eyepiece including Cross Line Graticule and 10X non-focusing eyepiece, Strain Free Plan 4X, 10X & 40X objectives, Abbe NA 1.25 condenser, 360° rotating graduated stage. The ML9000 series microscope has 6v 30w incident Koehler illumination while the ML9900 series has transmitted and incident 6v 30w illumination. This EMT2 turret type stereo microscope has 1X & 3X objectives with 10X eyepieces giving 10X & 30X magnification which is standard throughout the industry. Or PBH-Stand with F holder focus block, Halogen transmitted and incident illumination with intensity control, glass + Black/White stage plates. 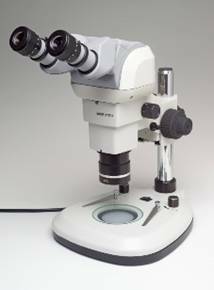 This economically priced stereomicroscope are well suited for the asbestos industry and has turret type objectives sets 1X/2X, 1X/3X and 2X/4X and comes standard with 10X eyepieces with 15X & 20X eyepieces options available. These stereomicroscopes come with either a plain pole stand without illumination or a PT stand with incident and transmitted halogen illumination. 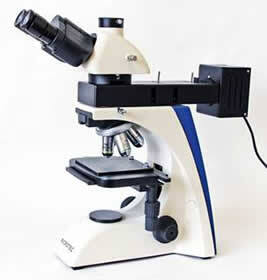 These microscopes can be matched up with fluorescence tube ring light or LED ring light. With our long experience in the servicing of microscopes we are able to help our customers with their choice in makes, models and requirements to suit their specific needs from routine laboratory microscopes such as the Nikon Ci-s to high specification research microscopes like the Olympus BX63 or fluorescence microscopes like the Leica DM2500 we can cater for all. In addition to being able to supply upright & inverted biological brightfield, darkfield and fluorescence microscopes from the big four manufacturers we are approved sales agents for Meiji Techno and Microtec microscopes. The following microscopes are just a small example of what we can supply so for more information and up to date quotations please Contact Us. The Meiji Techno MT4000 and MT5000 Series of biological microscopes have been designed as versatile, modular, ergonomic microscope systems which are ideally suited for many different laboratory uses. The ergonomic design allows the location of the controls to be in stress free position increasing efficiency and reducing the risk of RSI. The MT4000 & MT5000 series employs all new and improved optics. Meiji Techno’s ICOS™ (Infinity Corrected Optical System) makes the study of mounted specimens fast and easy while delivering an excellent cost-to-performance ratio. With options for binocular, trinocular and binocular ergo heads complete with 10X eyepieces as standard and optional 15X & 20X eyepieces. The MT4000 series is available in brightfield and phase contrast models while the MT500 series is available with models suitable for brightfield, phase contrast and has darkfield options. Both series have many different accessories for all models so they can be built to your exact requirements. The Microtec IM-2 Inverted microscope comes complete with excellent flat field phase contrast LWD Plan 4X, 10X & 20X objectives, Phase slider for 4x, 10x, 20x, & 40xx objectives. 10x/22mm eyepieces and phase telescope. The illumination comes for a 6v 30w Halogen lamp with intensity regulation. The standard model has a phototube incorporated; enabling a camera attachment to be readily added. The long working distance objectives are corrected for working through a 1.2mm thickness chamber. With optional items such as LWD Plan 40X objective, attachable mechanical stage and various dish/slide holders and stage extenders and C-mounts this microscope can be deigned to suit many different uses. And with its sister the IM-2R fluorescence microscopes Microtec has it all covered. We have a long history of working in the metrology and materials industries and with that experience / knowledge are able to offer our customers a range of metallurgical microscopes to their needs. 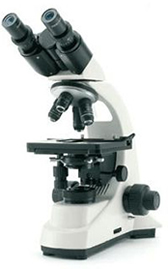 Being appointed distributors for Olympus and Nikon we are able to supply high end upright and inverted microscopes such as the Olympus BXiS or the GX51; medium priced microscopes such as the Meiji Techno MT7500 brightfield / darkfield upright microscope or the IM7000 inverted or the in-expensive Microtec range. 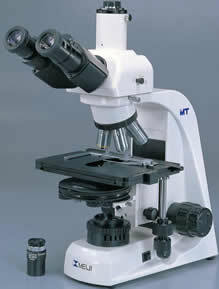 Evaluation of metallurgical specimens is fast and easy with Meiji Techno’s IM7000 Inverted Metallurgical microscope. The IM7000 delivers an excellent performance-to-cost ratio because it has the features and versatility that one would expect to find in more expensive instruments. The IM7000 has an integrated front mounted camera port with adapters available for 35mm, CCD, CMOS and other cameras. 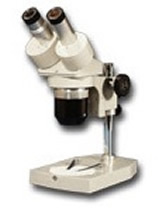 This modestly priced well designed upright metallurgical microscope comes in two models, the RM-1 MET complete with trinocular head, 10x eyepieces, incident 12V 50W illumination with field iris and aperture iris controls, mechanical stage and Planachromat 4X, 10X, 20X & 40X objectives. Or the RM-1 MET/T complete as above except also with transmitted 6V 30W halogen illuminator and focusing substage condenser. Both models have the option of adding Planachromat 50X &/or 80X objectives. We can also provide various illumination options to suit. Please refer to our Bulbs and Light Sources page. The following microscopes are just a small example of what we can supply, for more information and up to date quotations please Contact Us. Few manufacturers of stereo microscopes can match Meiji’s combination of superb optics, rugged dependability, economical pricing and wide range of accessories offered by Meiji Techno’s EM Series Stereo Microscopes. Turret stereo bodies (EMT) have two objective pairs in a turret mount that allows the viewer to change from one magnification to another (e.g. from 10x to 30x) by rotating the turret. While not as flexible as a zoom stereo (EMZ) body, turret bodies are more economical. The EMT series offers 4 different magnification combinations in both binocular and trinocular models, as well as a specialized extended working distance turret body (EMX-1) designed for users who need extra room to work with their hands under the microscope. 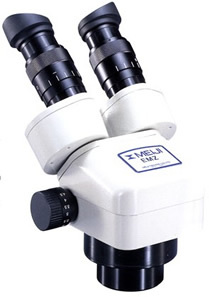 Zoom stereo microscope bodies (EMZ) are the most flexible because they offer a wider range of magnification than turret (EMT) or fixed bodies. 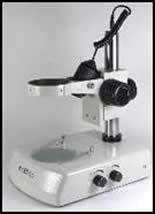 Zoom objectives increase and decrease magnification progressively, causing the specimen to grow or shrink smoothly in the eyes of the viewer holding their parafocality or focus throughout the zoom range. 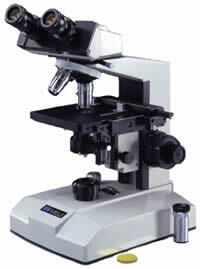 Meiji Techno offers EM Series zoom stereo microscope bodies with a wide range of magnifications and working distances. To go along with your new EM series body you will need a stand. Meiji Techno offers four ranges of stands to choose from. These are the Pole Stand, the Rigid Arm Stand, the Wide Surface Stand and Boom Stand. The following are an example of the most popular stands available from their wide range. Basic pole stand with “FC” coaxial coarse and fine focus block and integrated incident illuminator port on a plain base. 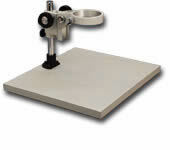 Supplied with one 94.5mm diameter reversible black and white stage plate and two stage clips. Illuminated pole stand with “F” focusing holder. Provides both transmitted and incident halogen illumination with variable intensity control. Supplied with 94.5mm diameter clear glass stage plate, reversible black and white stage plate and two stage clips. Illuminators may be operated independently or simultaneously. Rigid-arm stand with integrated focusing holder. Provides both transmitted and incident halogen illumination with variable intensity control. Supplied with 94.5mm diameter clear glass stage plate, reversible black and white stage plate and two stage clips. Illuminators may be operated independently or simultaneously. ABH stand is for use with turret stereo bodies (EMT) while the ABZH is for use with zoom stereo bodies (EMZ). Pole stand with FX holder focusing block and incident illuminator port mounted on a 380mm x 330mm x 20mm flat laminate base. Optional 100mm (4″) pillar extension (MA551) provides additional clearance for large specimens or extended working distances. 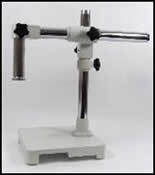 Industrial-type boom stand with 20mm diameter mounting post for F, FK, FX or FC focusing holders. Provides complete flexibility for horizontal and vertical adjustment. Sturdy solid metal 265mm x 265mm x 25mm base for excellent stability. Note: (F, FK, FX and FC focusing holders must be ordered separately). 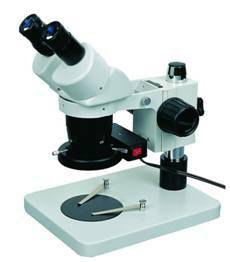 The HM-2 is an economically priced stereomicroscope. The objective turret contains two pairs of objectives and the magnification is changed by rotating the turret. Regulating transmitted and incident halogen illumination is built-in. There are three versions available with 1x/2x, 1x/3x and 2x/4x objectives. These microscopes provide the following magnifications and fields with the widefield 10x eyepieces. 15x and 20x eyepieces are also available as an optional extra. The HM-3 Stereo microscope has a built-in phototube and a zoom ratio range of 6.4:1 with a zoom range of 0.7x – 4.5x giving a magnification of 7x – 45x using 10x eyepieces as standard. A selection of stands, supplementary front lenses and eyepieces are available, enabling a range of magnifications from 3.5x to 180x to be achieved. 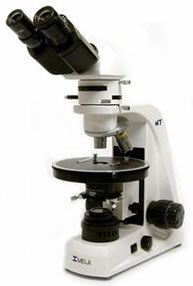 The HM-6 Stereomicroscope has a parallel optical path. This enables the camera port inserts to be inserted between the zoom magnification changer and the binocular viewing tube. The binocular head is of an ergonomic design with an inclination adjustment from horizontal to a 30° angle for comfortable viewing. With a zoom ratio of 6.6: 1 combined with a selection of different magnification eyepieces and objective lenses enable magnifications from 2x to 270x to be achieved. The transmitted light stand incorporates LED illumination and the focusing mechanism is coaxial course and fine. Single or double photo port systems are available. With many different accessories and stand types available please Contact Us and we would be happy to build a HM-6 to your specific requirements. 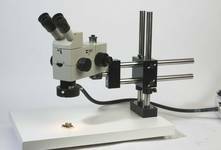 Optech Microscope Services are able to provide a varied range of microscopes for educational establishments such as Schools, Colleges and Universities. 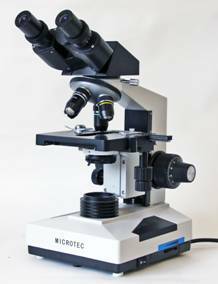 As we are agents to two different manufactures Kozo and Microtec we are able to provide an excellent range of basic / student microscopes including monocular and binocular biological microscopes and stereo microscopes. We know that budgets can be tight so we can give discounts for large orders enabling us to provide educational microscopes to suit most budgets. 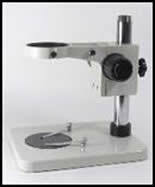 The following microscopes are just a small example of what educational microscopes we can supply. For more information and up to date quotations please Contact Us. 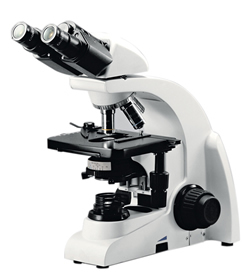 The CM-3 is a basic instrument suitable for use up to 400x magnification (10x eyepiece + 40x objective). A monocular eyepiece tube with 360 degree movement. 4x, 10x, & 40x DIN achromat objectives. Plan stage with fitted stage clips to securely hold a slide in place. Coaxial coarse and fine focus. Fixed sub-stage condenser with iris diaphragm. Built-in 6v 10w halogen illumination with brightness control. 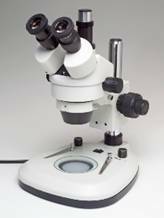 The XS-50 series offers a microscope course and fine focus DIN standard optics and halogen illumination for optimum microscopy. 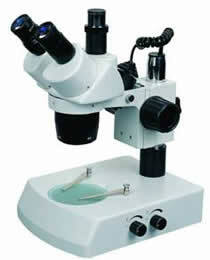 This microscope will always deliver clear and white illumination making them perfect for schools or long-term users. Monocular, binocular and trinocular models. 10x eyepieces as standard with optional 15x and 20x. The XJS300 series of biological microscopes come with infinity corrected Plan achromatic optical system so that chromatic aberrations and curvature of field are both ideally corrected over the field of view. This series comes in either binocular or trinocular models with 6v 20w halogen illumination as standard but also has 6v 30w halogen or LED illumination as options. The PM-3 is an advanced student microscope and with its many optional accessories is perfect for college and university use. 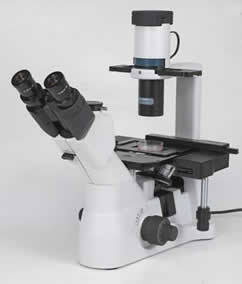 This microscope is available in both binocular and trinocular models enabling you to add a camera for photo microscopy. With optional accessories including 20x & 60x objectives, Focusing 10x eyepiece with scale graticule and C-mounts this microscope can be tailored to suit many requirements. 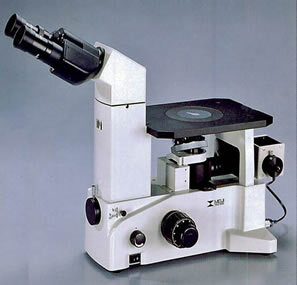 The XJS500 is a built-to-last, top-of-the-range biological microscope ideal for basic laboratory use or educational purpose. Of course the XJS500 maintains the same operational ease and rigidity common to all Kozo microscopes. And also the digital camera can be attached when the trinocular head is mounted. Binocular and trinocular viewing heads inclined at 30deg with 360deg rotation. Wide Field 10x/20mm eyepieces as standard with others as options. Plan achromat 4x, 10x, 20x, 40x and 100x oil objectives as standard. Abbe condenser with iris diaphragm. Blue Filter (Green and Amber as options). 6v 20w halogen illumination with 6v 30w halogen or LED illumination as options. Phase contrast and dark field options. The Kozo XJD300 Digital is a digital version of the XJS series that features a built-in imaging head with 1.3MP streaming live output through a USB2.0 connection to PC’s, laptops and many projection systems. The XJD300 is a robust student instrument that brings professional, repeatable image quality results to all its intended applications. Binocular viewing head with built in 1.3 mega pixel CMOS camera. Achromat 4x, 10x, 40x and 100x oil objectives. Optional Accessories including eyepieces, objectives and higher mega-pixel cameras.